Which explains why I have never seen Glee. It’s not that I think it’s bad or lame, I just tend to avoid (be it consciously or not) anything that is hyped up, popular, or mainstream. That is, until I get a taste of something and I realize that I actually like said pop culture trend. Take, for instance, the story of me and a very famous horse…Some of you might remember a few years ago when the movie Seabiscuit came out. I would see the commercials showing the preview for the film and scoff at the television. A movie about a horse? And a horse named Seabiscuit no less? Umm, thanks, but no thanks. Later, my boyfriend (who is now my husband) asked if I wanted to watch the poorly named horse movie one night. I declined. I explained how I figured it just couldn’t be good. Too many people had seen it. It was too hyped up. It was sure to be a let down so I would just save myself the trouble and avoid it all together. And there it was, I was converted from an anti-horse movie girl to the world’s biggest Seabiscuit fan. So what’s the moral of the story? I’m not quite sure, except to say that I have realized: the more resistant I am to a popular trend or phenomena, the more (if given a chance) I will inevitably love that particular thing. I guess the reason is that my initial avoidance of something because it is regarded as “cool” is sort of a prideful response. I say I don’t like things just because someone else does. What kind of loving, gracious person does that? Sheesh, I sound like some fun-squashing troll. I want to learn how to enjoy what I want to enjoy regardless of its inherent or perceived coolness. I want to love zombies because I love zombies, not because some geek on Ain’t It Cool News told me to. And if I secretly have a desire to try leggings and, yes, even jeggings, I should just go for it! I should throw caution to the wind and pull those unflattering stretchy pants up high! Really high! Do you ever find yourself resisting something just because it is popular? What are some trends you avoided but then found were actually great? I like your resistant nature. And thank goodness for Seabiscuit so that I can always reference that. I swore up and down about how lame Twitter was…and here I am on it everyday. It’s kind of embarrassing. Glad I’m not alone on that one. Babywearing! I hear ya there. And with the addition of baby three, I realized I was out of hands and now couldn’t survive a trip even to the mailbox without my Ergo. Yes I did! Pretty crazy that all over the world women do the same thing. Maybe we aren’t so different as we like to think. And yes, my baby 3 has been my most demanding…by a long shot. Great examples, especially about Creed. I almost mentioned them in this post. I never liked them but I see how trendiness just spurs on likability, except to the small few who find things uncool by virtue of their popularity. I never saw a Seinfeld episode until maybe 3 or 4 years after it went off the air. I have to say though, I think it’s funny. It grows on you. And give Lost a chance. It is perhaps the greatest show ever made! come on now and get yourself all shiny and gleed up! I will admit I’m a gleeker! From my first onstage performance as the queen in Puff the Magic Dragon (which did not require singing mind you) I find myself (famous for not being able to sing a note) wanting to sing and dance at the top of my lungs…it brings back memories of watching 7 brides for 7 brothers or the oh so famous The Wiz (eazing on down the road)…there i go having dreams of being a singer…well nonetheless maybe the next time i see you i will burst into song with a little known tune called “Amazing Grace” the remix! And The Wiz is one of my favorites too. Diana Ross is like a queen to me. So you’re tellin’ me that I’ll like Glee huh? Maybe I’ll give it a shot on your recommendation. P.S. I bet you were the cutest little Puff the Magic Dragon around. Low-waisted pants. That whole phenomenon started while I was living in another country. When I got back I decided I would just wait it out and not buy any pants until the fad was over. Well that fad has lasted 10 yrs now, and my resolution not to buy pants lasted about 4 months. It is easier to gain weight in the US than in 3rd world countries! Girl, you need to just JUMP ON THE BANDWAGON! :) It sure is a lot easier to ride on the wagon than walk next to it. :) So strap that toddler on with a babycarrier (he’s not too old!) buy some leggings (forever21 sells them for like 6 bucks!) and watch Glee because it. is. funny. And this post was great. Miss you, girl. Hope to see you sometime soon! Thanks Mel. You comment made me laugh! I’m gonna jump on, really I am…I’ll let you know how it goes. Miss you too and hope all is well with you and your family! My whole resistance was Facebook and Twitter. I was like, that is the devil trying to get people addicted to the internet and not to the Lord. Now I look at people who are not connected like “What is wrong with you?” and I pray for them. LOL :) I have a few more but we would have to use the rest of the evening for those. lol. Yes, the Internet and Facebook is of the devil. That is funny. It’s just like anything, it can be addicting and distracting…or we can learn to balance it and use it to encourage friendships and relationships. I was so opposed to both for so long…and here I am, using both daily. I love that you are praying for those not connected… :) so funny! Thanks for the great comment. I’ve never watched glee, and I don’t have a clue what that is. I don’t have cable though. However, I just had to toot my own horn and tell you that you really should babywear. I wore my child before it WAS cool, and nearly 12 years later, I’m still babywearing (not the same kid, of course). Most of my IRL friends came from a babywearing group! I like that you’re a *reject* though. Just so you know. :) I like being odd and different too. Now, go find a baby and wear it for a while. Ade, I would have to borrow a baby to babywear. My “baby” is now 2 and there is no way, no matter how fancy the carrier, that I am toting him around. He. Is. Heavy. Have you seen the new Ergo baby carrier? Apparently it’s all the rage. My friend Carrington has a blog called Organic Life Love and she wrote a great post about the history of babywearing. http://bit.ly/bJJX1A You would enjoy it I think. And thanks for being a reject along side me…we make the world a more interesting and uncommon place. …I feel that same tension – I want to be noticed and different rather than just ME. So are you going to watch Glee? And to answer your question….yes, I’m going to watch Glee, if not because of this post alone. I’ll write an update afterward with my reaction. Do you watch? You are SO funny! This cracks me up! I would call myself a reject too, but I’m a little bit different. Maybe I see awesome trends before they happen or something, but I always end up doing something different, and then it becomes a huge “trend” and then I hate it because I hate being like everyone else and being “trendy” lol. And unless it’s totally awesome (Like babywearing, twitter, blogging, leggings and GLEE!) I will usually STOP doing it so that I don’t look like everyone else! ha! Because let me tell you- it’s worth all the hype, it’s SO good. My cycle is exactly the same as the one you described. In high school I started wearing funky cool socks. No one else was. About 4 months later, wouldn’t you know….every girl had cool socks. so I ditched that trend and thought of a new one. So ridiculous. Imitation is flattery, truly. I was just a snob. And no I haven’t watched it yet but I am going to. 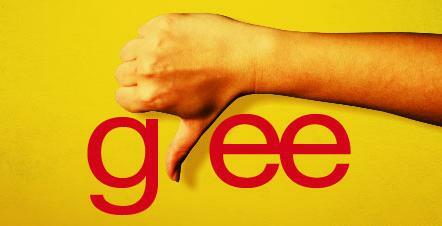 Wanna have a Glee night for my first time watching? PS You are so welcome for the link love. I loved that post and babywearing is hot…like the Wikipedia woman hot…really, really hot! Oh, and I also wanted to mention that my next babywearing post will include a picture of me wearing Thatcher in the “attire” of the woman from the wiki page. Oh, and for the record, I think you are wrong, you are not in between AT ALL. I’ve never seen The Titanic for the exact same reasons. I am resistant to all things hype. You will never see me with a gigantic metallic, metal-studded shoulder bag. That said, it’s a wee bit harder now, to be trend-resistant, but for an odd reason that I don’t know quite how to explain. I just remember being in middle school, in the mid-80s, and seeing women who were in their 20s (or thereabouts) with frosted blue eyeshadow, which was SO 1970s. And, I remember thinking, “COME ON! THIS IS 1985!! THE 70s WERE A WHOLE FIVE YEARS AGO! !” Similarly, seeing women my age (I’m 37) with layered and feathered hair — not updated feathered & layered — curly, early 90s style. Awful. IOW, I resist being trendy, but neither do I want to look so ridiculous because all my “style” is ten years old. Or more. Know what I mean? And, as I age (Lordy! ), it’s tougher to stay on top of things, and know what’s WAY out. I will never forget, though, patting myself heartily on the back for being a trend-breaker while I was in high school. I had a pen pal (real paper, real pen) who lives in Scotland, and he jolted me out of my self-congratulation, by letting my know I was just as controlled by trends when I purposefully don’t follow them, as someone who traipses merrily after each and every one. So, now, I try better to just like what I like, and not really care who thinks what about it. It does make me more mad than it should, though, when masses of people start liking things that I have liked for years. Like bands. I loved R.E.M. when they were a tiny, unknown small-bar band from Georgia. And the name Ethan!! When I named my 13yo son, people were like, “What?? Nathan? ?” The majority of people I met had never heard the name. Now, it’s been on the SSA list of top ten American boy names since 2002, and every park we go to, there’s a half-dozen small Ethans wandering around, with mothers shouting their names. Ugh. Poor boy. Great comment Karen. I love how your pen pal set you straight. I’m a little convicted by that too. hmm…I guess in resisting trends and purposely avoiding them, I am by default allowing them some amount of control. Interesting…. And yes, things we love like R.E.M. for you and perhaps Dashboard Confessional for me, are suddenly threatened when other people take notice. It’s as if we try and keep them a secret, all to ourselves, instead of share the goodness with others. So silly. P.S. I too had a real pen pal..paper and pen. My friend Yoko in Japan, who later accepted Christ and flew from Japan to attend my wedding. I hope my kids have a great pen pal experience too. It is so awesome! I’m so there. I’ve never seen Avatar and have no intention of seeing it. You’re holding out on Avatar huh? I like that…My husband is a movie geek so it is really hard for me to refuse a movie these days but I stand my ground when necessary. I dig your blog too by the way Daja! Thanks for stopping by over here and commenting as well. I hope to hear more from you in the future! Ever run into yourself online? I saw from my blog stats that I got some traffic from here, but couldn’t remember when I had commented. So, I clicked over here, started reading a bunch of stuff, got lost and just ran into my own comment. LOL! Next Next post: Is it Okay to Have Rules in Marriage?